The bestselling author of The Trouble with Goats and Sheep delivers a suspenseful and emotionally satisfying novel “infused with warmth and humor” (People) about a lifelong friendship, a devastating secret, and the small acts of kindness that bring people together. There are three things you should know about Elsie. The first thing is that she’s my best friend. The second is that she always knows what to say to make me feel better. And the third thing…might take a bit more explaining. Eighty-four-year-old Florence has fallen in her flat at Cherry Tree Home for the Elderly. As she waits to be rescued, she thinks about her friend Elsie and wonders if a terrible secret from their past is about to come to light. If the charming new resident is who he claims to be, why does he look exactly like a man who died sixty years ago? From the acclaimed, bestselling author of The Trouble with Goats and Sheep, Three Things About Elsie “breathes with suspense, providing along the way piercing, poetic descriptions, countless tiny mysteries, and breathtaking little reveals…a rich portrait of old age and friendship stretched over a fascinating frame” (Kirkus Reviews, starred review). This is an “amusing and heartbreaking” (Publishers Weekly) story about forever friends on the twisting path of life who come to understand how the fine threads of humanity connect us all. It all started a month ago. A Friday morning. I was glancing around the room, wondering what I’d done with my television magazine, when I noticed. It was facing the wrong way. The elephant on the mantelpiece. It always points towards the window, because I read somewhere it brings you luck. Of course, I know it doesn’t. It’s like putting new shoes on a table, though, or crossing on the stairs. There’s a corner of your head feels uncomfortable if you don’t follow the rules. Normally, I would have blamed one of the uniforms, but I always go over everything with a duster after they’ve gone. There’s usually a need for it and it helps to pass the time. So I would have spotted it straightaway. I notice everything. Miss Ambrose had arrived for our weekly chat. Fidgety. Smells of hair spray. A cousin in Truro. I decided to test her. She scanned the room, but any fool could tell she wasn’t concentrating. She didn’t take me seriously. She never does. “It must have been one of the cleaners,” she said. I wouldn’t let her find my eyes. I looked at the radiator instead. “I wouldn’t dream of it,” I said. I went over to the mantelpiece and turned the elephant to face the window again. I stared at her the whole time I was doing it. I watched the elephant while she rummaged around in the kitchen, trying to locate a ginger nut. Miss Ambrose sat on the very edge of the armchair. She always wore cheerful clothes, it was just a shame her face never went along with it. Elsie and I once had a discussion about how old Miss Ambrose might be. Elsie plumped for late thirties, but I think that particular ship sailed a long time ago. She always looked like someone who hadn’t had quite enough sleep, but had put on another coat of lipstick and enthusiasm, in an effort to make sure the rest of the world didn’t ever find her out. I watched the radiator again, because Miss Ambrose had a habit of finding things in your eyes you didn’t think anyone else would ever notice. There are twenty-five grooves on that radiator. They’re quite difficult to count, because if you stare at them for any length of time, your eyes start to play tricks on you. I’ve got a drawer full of those cards. I could congratulate half a dozen people on the birth of their beautiful daughter with one pull of a handle. “Perhaps next week,” I said. I heard Miss Ambrose take a deep breath. I knew this meant trouble, because she only ever does it when she needs the extra oxygen for a debate about something. Miss Ambrose was one of those people whose sentences always went up at the end. As though the world appeared so uncertain to her, it needed constant interrogation. I glanced out of the window. Everything was brick and concrete, straight lines and sharp corners, and tiny windows into small lives. There was no horizon. I never thought I would lose the horizon along with everything else, but when you get old you realize whichever direction you choose to face, you find yourself confronted with a landscape filled up with loss. “It’s not much fun when no one listens to what you say.” I spoke to the radiator. “It’s a figure of speech, Florence. That’s all.” Miss Ambrose’s shoes tapped out a little beige tune on the carpet. She pulled out a silence, like they always do, hoping you’ll fill it up with something they can get their teeth into, but I was wise to it now. “It’s Gone with the Wind tomorrow afternoon,” she said eventually, when the silence didn’t work out for her. “I’ve seen it,” I said. I wanted to say, “Why have I got to meet anybody halfway to anywhere?” but I didn’t. I concentrated on the radiator instead, and I didn’t stop concentrating on it until I heard the front door shut to. There are three things you should know about Elsie, and the first thing is that she’s my best friend. People chop and change best friends, first one and then another depending what kind of mood they happen to find themselves in and who they’re talking to, but mine has always been Elsie and it always will be. That’s what a best friend is all about, isn’t it? Someone who stands by you, no matter what. I can’t say we haven’t had our arguments over the years, but that’s because we’re so opposite. We even look opposite. Elsie’s short and I’m tall. Elsie’s tiny and I have big feet. Size eleven. I tell everybody. Because Elsie says there comes a point when feet are so large, the only thing left to do is to boast about them. We spend most of our time with each other, me and Elsie. We even opted to eat our meals together, because it makes it easier for the uniforms. It’s nice to have a bit of company, because nothing in this world sounds more lonely than one knife and fork rattling on a dinner plate. It was later that day, the day Miss Ambrose gave me my ultimatum, and Elsie and I were sitting by the window in my flat, having our lunch. “They’ve still not shown their face,” I said. I knew she’d heard me, the woman in the pink uniform. She was dishing up my meal on a wheel three feet away, and I’m a clear speaker, even at the worst of times. Elsie says I shout, but I don’t shout. I just like to make sure people have understood. I even tapped on the glass to be certain. The woman in the pink uniform spooned out a puddle of baked beans. She didn’t even flinch. “Don’t shout, Flo,” she said. “So why don’t you write a letter?” said Elsie. “Miss Ambrose has put me on probation.” I spoke into the glass. “They’ll clear it all away soon, Miss Claybourne,” said the woman. We both watched her. She gave nothing away. “I wonder who that is,” I said. “I wonder as well,” said Elsie. I raised my eyebrow at Elsie, but Elsie went back to her fish finger. Elsie gave up far too easily, in my opinion. There was a badge on the front of the woman’s uniform that said HERE TO HELP. The words hovered for a while in midair. “All I know is it’s a man,” she said. “Are you certain?” I said. Yes, she said, yes, she was quite certain. Elsie and I exchanged a glance over the tablecloth. There were very few men at Cherry Tree. You spotted them from time to time, planted in the corner of the communal lounge or wandering the grounds, along paths which led nowhere except back to where they’d started. But most of the residents were women. Women who had long since lost their men. Although I always thought the word “lost” sounded quite peculiar, as though they had left their husbands on a railway platform by mistake. “She wasn’t here very long,” I said. The skip was filled with her life—Brenda’s, or Barbara’s, or perhaps Betty’s. There were ornaments she had loved and paintings she had chosen. Books she’d read, or would never finish, photographs which had smashed from their frames as they’d hit against the metal. Photographs she had dusted and cared for, of people who were clearly no longer here to claim themselves from the debris. It was so quickly disposed of, so easily dismantled. A small existence, disappeared. There was nothing left to say she’d even been there. Everything was exactly as it was before. As if someone had put a bookmark in her life and slammed it shut. “I wonder who’ll dust my photograph after I’m gone,” I said. “Does it matter, Flo?” she said. When I turned around, Elsie was smiling at me. “Which one was that, then?” I said. The pink uniform had left us with a Tunnock’s tea cake and the Light Programme. Elsie insisted it was called Radio 2 now, but perhaps she’d given up correcting me. “Is she the one with a wise head on her shoulders?” I said. There were so many of them. Miss Bissell’s “army of helpers.” They marched through Cherry Tree, feeding and bathing and shuffling old people around like playing cards. Some residents needed more help than others, but Elsie and I were lucky. We were level ones. We were fed and watered, but apart from that, they usually left us to our own devices. Miss Bissell said she kept her north eye on the level ones, which made it sound like she had a wide range of other eyes she could choose from, to keep everybody else in line. After level three, you were moved on, an unwanted audience to other people’s lives. Most residents were sent to Greenbank when they had outstayed their welcome, which was neither green, nor on a bank, but a place where people waited for God in numbered rooms, shouting out for the past, as if the past might somehow reappear and rescue them. “Why in heaven’s name would you want to see him, Florence?” Elsie sat back, and her cardigan blended in with the sideboard. We sat by the window in my flat, because Elsie says it has a much better view than hers, and the afternoon wandered past in front of us. More often than not, there’s something happening in that courtyard. Whenever I’m at a loose end, I always look out of the window. It’s the best thing since sliced bread. Much more entertaining than the television. Gardeners and cleaners, and postmen. No one ever taking any notice whatsoever of anyone else. All those separate little lives, and everyone hurrying through them to get to the other side, although I’m not entirely sure they’ll like what they find when they get here. I doubt it was anything to do with the woman who dished up our baked beans, but a short while later, two men arrived to collect the skip. I watched them. They loaded someone’s whole life into a truck and drove it away. There wasn’t even a mark on the pavement to say where it had been. I watched someone walk through the space where it had stood. Everything carried on as it always did. People rushed from place to place to keep out of the rain, uniforms traveled along stairwells, pigeons walked out their time along the lengths of guttering and waited for the right time to fly away to somewhere else. It felt as though the impression this woman had made on the world was so unimportant, so insignificant, it dissolved away the very moment she left. I was fairly sure she was smiling, but I couldn’t tell you for definite, because I wouldn’t give in to looking. I kept my eye on number twelve, but nothing happened of any interest. About three o’clock, Miss Bissell marched up the communal stairwell with a clipboard and an air of urgency. “Miss Bissell,” I said, pointing. “So it would seem,” she said. We measured out our afternoon with pots of tea, but the rinse of a September light seemed to push at the hours, spreading the day to its very edges. I always thought September was an odd month. All you were really doing was waiting for the cold weather to arrive, the back end, and we seemed to waste most of our time just staring at the sky, waiting to be reassured it was happening. The stretch of summer had long since disappeared, but we hadn’t quite reached the frost yet, the skate of icy pavements and the prickly breath of a winter’s morning. Instead, we were paused in a pavement-gray life with porridge skies. Each afternoon was the same. Around four o’clock, one of us would say the nights were drawing in, and we would nod and agree with each other. Between us, we would work out how many days it was until Christmas, and we would say how quickly the time passes, and saying how quickly the time passes would help to pass the time a little more. The winters at Cherry Tree always took longer, and this would be my fifth. It was called sheltered accommodation, but I’d never quite been able to work out what it was we were being sheltered from. The world was still out there. It crept in through the newspapers and the television. It slid between the cracks of other people’s conversation and sang out from their mobile telephones. We were the ones hidden away, collected up and ushered out of sight, and I often wondered if it was actually the world that was being sheltered from us. “The nights are drawing in, aren’t they?” said Elsie. We watched the lights begin to switch on in the flats opposite. Rows of windows. A jigsaw of people, whose evenings leaked out into a September dusk. It was the time of day when you could see into different lives, a slice of someone else, before their world became curtained and secretive. “Someone’s in number twelve,” I said. Most of the uniforms had gone home, and Miss Bissell and her Mini Metro had long since sped through the lights at the bottom of the road and vanished up the bypass, but a bulb had been switched on in the lounge of number twelve. It faltered, like the reel of a cine film, and I watched, frame by frame, as a man walked across the room. Middle-aged, I thought, but the faulty light made it difficult to be sure. I felt a catch of breath in my throat. “How strange,” I said. I watched the man. He wore a hat and an overcoat, and he had his back to us, but every so often he showed the edge of his face, and my mind tried to make sense out of my eyes. “How very strange,” I whispered. Elsie went back to sweeping crumbs, and I pulled the sleeves down on my cardigan. I definitely must have made a mistake. Because anything else was impossible. We were halfway through Tuesday before I saw him again. Elsie was having her toenails seen to, and it always takes a while, because she’s difficult to clip. One of the uniforms was dusting the flat, and I was keeping my eye on her, because I’ve found people do a much more thorough job if they’re supervised. They seem to appreciate it when I point out something they’ve missed. “How would we manage without you, Miss Claybourne,” they say. This particular one was especially slapdash. Flat feet. Small wrists. Earrings in her nose, her lips, her eyebrows—everywhere except her ears. There was a mist. The kind of mist that hammers the sky to the horizon to stop any of the daylight getting in, but I saw him straightaway, as soon as I turned to the window. He sat on one of the benches in the middle of the courtyard, staring up at number twelve. He was wearing the same hat and the same gray overcoat, but that wasn’t why I recognized him. It was because of the way he pulled at his collar. The way he wore his trilby. The very look of him. You can spot someone you know, even in a strange place or a crowd of people. There’s something about a person that fits into your eyes. I wanted to point him out to the girl with the earrings. I wanted to make sure she could see him as well. You hear about it, don’t you? Old people’s minds conjuring things up from nowhere and inventing all sorts of nonsense to fill the empty space, but the girl was in the middle of having a conversation with herself, and pushing a duster around the mantelpiece. And I was on probation. Miss Ambrose hadn’t gone into detail, but I was fairly certain hallucinations wouldn’t go down particularly well. When I looked again, the man was still sitting there, but his elbows were resting on the back of the seat, just like they always used to. As I watched, I felt the color leave my face. I wanted to knock on the glass, make him turn around, but I couldn’t. Because if I did, I might never be able to look away. The girl stood in front of the television with a can of Pledge. The earrings covered her face like punctuation marks. Sometimes, words just fall out of your mouth. Even as they leave, you know they really shouldn’t, but by then it’s too late and all you can do is listen to yourself. The girl said, “Who’s Ronnie Butler?” and curiosity made all the earrings rearrange themselves on her face. I pulled at the edge of the curtain, even though it was perfectly straight. I waited before I answered. I waited until the basket had been filled, until I’d heard the click of the front door, and the drag of the girl’s feet along the corridor outside. I waited for all of that before I answered her question. And when I did, the words still came out in a whisper. Elsie had returned from the chiropodist, and she was admiring his craftsmanship through her tights. “Oh, all the time,” she said. I hadn’t moved from the window since I saw him. Or thought I saw him. I had watched staff disappear into buildings, and visitors forced to shuffle around the grounds with faded relatives, but I hadn’t seen the man again. Number twelve was quiet and dark, and the bench was deserted. Perhaps I’d invented him. Perhaps this was the start of my mind crossing over the bridge between the present and the past, and not bothering to come back. Elsie was watching me now. “Who do you think you saw?” she said. I felt all the space behind my eyes fill up. “She’ll never cope,” I whispered. Elsie didn’t reply, but I thought I saw her shoulders give a little shrug. “You haven’t seen anyone interesting, then?” I said. She was the only one left. The only one who would know if my mind had finally wandered away and left me all to my own devices. But sixty years ago, we’d packed up the past, and parceled it away, and promised ourselves we’d never speak of it again. Now we were old. Now we were different people, and it felt as though everything we went through had happened to someone else, and we had just stood and watched it all from the future. “Me too,” I said, into the cup. 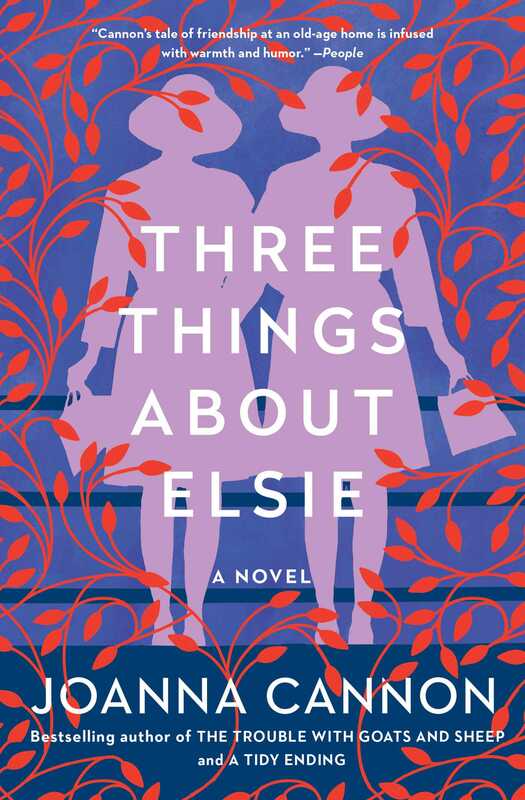 This reading group guide for Three Things About Elsie includes an introduction, discussion questions, and ideas for enhancing your book club. The suggested questions are intended to help your reading group find new and interesting angles and topics for your discussion. We hope that these ideas will enrich your conversation and increase your enjoyment of the book. Eighty-four-year-old Florence has fallen in her flat at Cherry Tree Home for the Elderly. As she waits to be rescued, she thinks about her best friend, Elsie, and wonders if a terrible secret from their past is about to come to light. If the charming new resident is who he claims to be, why does he look exactly like a man who died sixty years ago? 1. 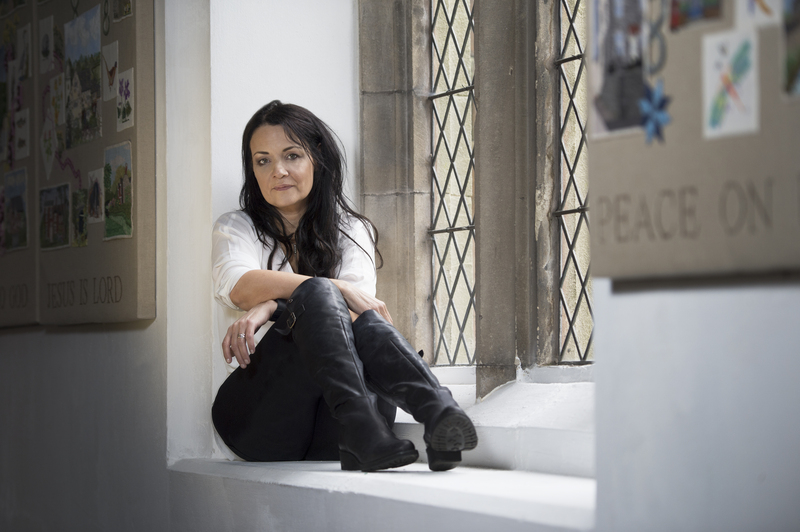 Why do you think author Joanna Cannon decided to set the novel in a nursing home? 2. On page 63, Florence says, “I needed someone to hold my worrying for me.” How does Elsie play this role for her? 3. The act of naming and renaming things is a recurring theme in the novel. Why do you think this is significant? 4. Did Florence’s failing memory change your understanding of events at Cherry Tree? Does it make her a less reliable narrator? Why or why not? 5. “Simon wondered where his life ended and their life began, and how we could all be stitched so tightly together, yet the threads between everybody still go unnoticed” (page 124). How does this idea of the bonds between humanity play out throughout the novel? 6. “‘You’ve got to find forgiveness, Florence,’ said Elsie. ‘You find it so easily in other people, why do you struggle so much to find it in yourself?’” (page 334). Why do you think Florence struggles to forgive herself for the past? 7. Consider the role of time in novel, especially Florence’s idea of a “long second”—when time seems to hesitate just long enough to give you a chance to make the right decision. Have you experienced any “long seconds” in your life? 8. Florence and Simon both repeat throughout the novel that they have lived very ordinary lives. Do you think this is the case? How do you think ordinary versus extraordinary is measured? 9. “Sometimes, a name is the only thing we can leave behind,” Florence says on page 103. Do you think this is true? What else do you think Florence will leave behind? 10. Did the third thing about Elsie come as a surprise to you? Why or why not? 11. What do you think makes Florence ultimately realize that she has lived an extraordinary life, in the end? 1. Take turns using three things to describe the members of your book club the way Florence describes Elsie. 2. Read Joanna Cannon’s first novel, The Trouble with Goats and Sheep. Do you notice any recurring themes between the two books? "A wonderful and entertaining feel-good story." "Florence attempts to unravel a mystery in this blend of crime thriller, character study, and treatise on the nature of memory."